reinforces the standing of whisky as an international spirit of high quality and venerable tradition. On the other hand, as someone who has studied carefully and written on the subject, I like to form my own judgments. They don’t always concur with what others say. A good example is the Crown Royal Northern Harvest Rye Whisky huzzah of a few years ago. The well-drawn LCBO product description gives the background, here. I bought a number of bottles before, during and after the period the awards got high publicity. I could never see the fuss. The whisky benefits from an obviously high straight whiskey component – lots of taste – but doesn’t cohere well, IMO. Yet, it obviously got peoples’ attention, which brings buzz and interest to the whisky business. That tends to be good for everyone, producers, consumers, governments (the revenue). In terms of Canada where the blended style constitutes most of what is available, no one will convince me blended whisky is on a par with straight or single whisky. That blends appeal to many people is unquestioned and salutary, as is the generally lower price they fetch than straights. But from a palate point of view, the straights will almost always have the edge for me. This is due to their heavier body and more complex taste than results from a largely silent spirit base, albeit aged, mixed with a small amount of straight whisky. (Straight or single as I use them here means, distilled at a low proof as the world’s traditional spirits are, for example Cognac, bourbon, tequila, malt whisky). I suspect this is so for most devotees of the whisky palate and that is why Canada until recently didn’t figure in the top rank of world producers. It’s changed to a degree but that is due to introducing a few straight whisky products, or blends with a high degree of straight whisky as the Northern Harvest, or Alberta Distillers’ Dark Horse, say. Yet, to every rule there is an exception. A couple of blends have an outstanding character. 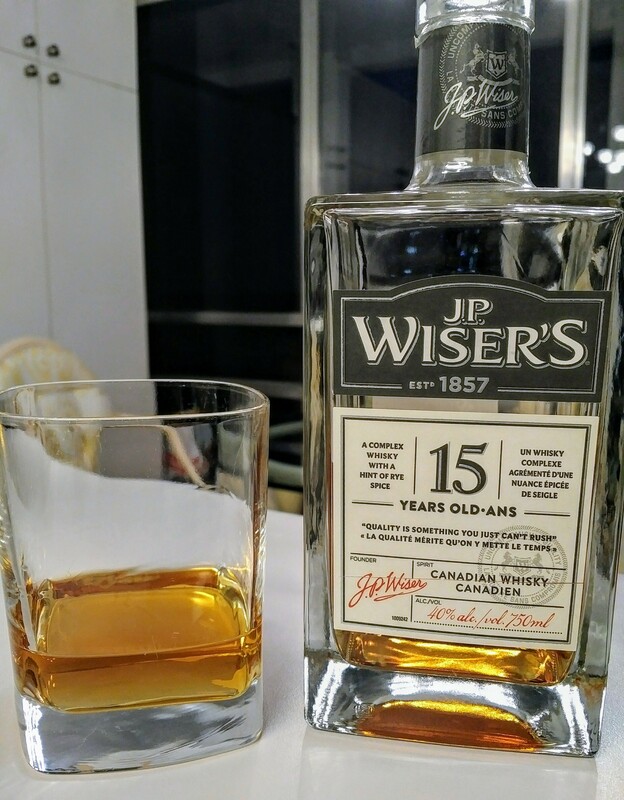 The best is JP Wiser’s 15 Years Old, introduced to replace the Wiser’s Legacy brand which was a good effort but not more IMO. The JP Wiser’s 15 is outstanding because it has a very good flavour, that cigar box some older whiskies have, Canadian Club 20 years old, for example. And it drinks pillow-soft, the grain whisky element doesn’t stick in the throat with a peppery bite. The straight element is extremely well-blended, probably it’s a minimal amount but sometimes less is more. It’s just a very good flavour and texture, you have to taste it to see. Of course I’m talking about neat sipping, meaning really neat – no ice, no water in this case. For mixed drinks the differences I’m highlighting aren’t that meaningful and perhaps the blends even have the edge often. It would be interesting as well to compare, say, a CC 20 years old-and-Coke with a regular CC-and-Coke. Don’t assume the former is better. A couple of the deluxe Crown Royals are somewhat comparable to JP Wiser’s 15 Years Old but still not as good. I hope the next batch retains the same qualities. On verra. An “old Durham boy” set down reminiscences of his boyhood in Enniskillen, Ontario in the 1860s including memories of taverns and the sale of whisky to locals. The time of recording was around 1920 as he refers to the prevailing “prohibition”. 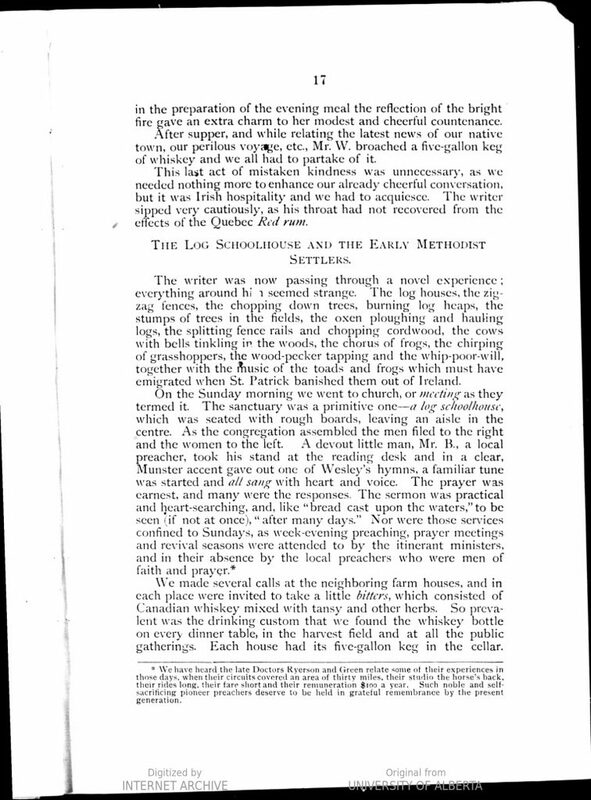 The account may be viewed here in the opening paragraphs. There are two small Enniskillen localities in Ontario. The Durham Old Boy meant the one that is today a hamlet in Clarington Municipality east of Toronto, in the general vicinity of Oshawa and Bowmanville. This google view shows the hilltop mentioned in the account, still a charming locality, dominated by the General Store (scroll left) which is famous for ice cream in the area. A search of “whiskey” and “whisky” on the general site, www.ontariogeneology.com, uncovers many additional interesting accounts. Quite a few resemble stories I’ve reported earlier involving “raising” and other bees, cheapness of whisky, excessive consumption, etc. but there is always the new insight or angle. In this case, it is clear the Durham Old Boy is describing a kind of blending, as one gallon of “genuine” whisky is used to make two barrels suitable to sell to tavern customers. This cannot be a mere reduction of proof by water as even the strongest highwines would not produce more than three or four gallons for retail sale when diluted. I think what occurred is that one gallon of old rye or corn whisky distilled at a low proof was blended with high-proof neutral spirits, possibly aged by then, to form a blended whisky. If the single gallon was full of “heavy” distillation flavours, even one gallon might lend a certain flavour. Perhaps as well sugar or other flavourings were added as part of the “secret”. We don’t know how big the barrels were here of course, but in any case a blending seems to have been going on. Even in the 1890s the Canadian Royal Commission to which I referred in earlier posts, examining the liquor traffic, took evidence suggesting blending by some retailers. See also in the same hearings this delphic reference to a cheap “tavern whisky”. Such blending might occur with whisky of different qualities, itself a feature of late Victorian distilling. Better stills enabled the production of higher-purity alcohol (at least in chemical terms) than with the old single and double pot stills. Canadian distilling after 1850 was capable of producing spirit at 86% abv via the multi-chambered still, and finally 94% abv by steam distillation in analyzing and rectifying towers. This was not completely new. For example, in Kingston, ON in 1835 a distiller advertised that his “patent copper rectifying apparatus” could deliver different proofs including “alcohol”. But clearly the large distillers after about 1860 based their trade on large production of high proof spirits. Blending of this sort was taking place contemporaneously in the cellars of Scottish grocers: many famous blends started this way including Johnnie Walker. What may well have happened was that distilleries in the U.K. and North America finally adopted the blending practices originated by taverners and grocers. The drink as delivered to the consumer in 1860s Enniskillen probably was not 40% abv. To serve even inexpensive whisky that strong in a beer glass – at least 8 ounces and probably often more – seems unlikely. I’d think the spirit was probably around 20% abv. The mixing barrel was likely a combination of the single gallon of “real” whisky, a strong highwines, water, and perhaps flavourings or colour. 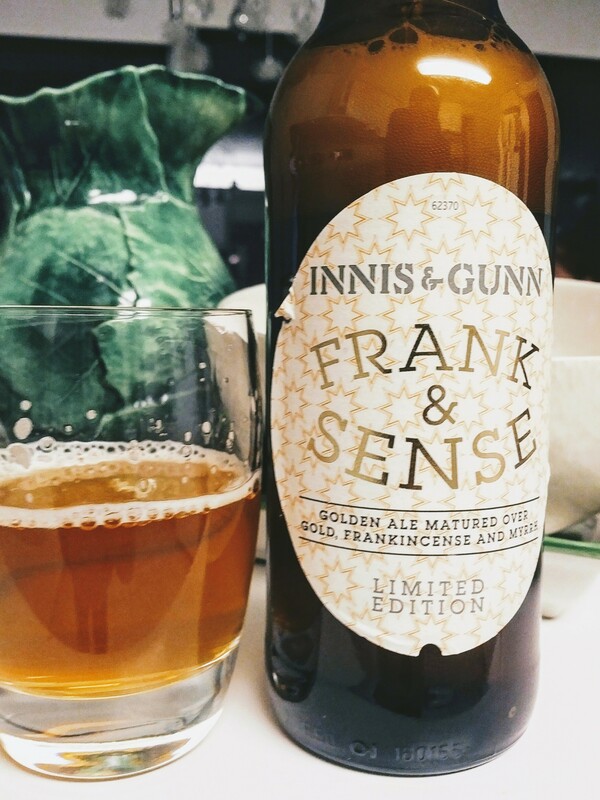 I’m on the list to receive new Innis & Gunn releases and drank the Frank & Sense Xmas release, described as a “golden ale matured over gold, frankincense and myrrh”. Exotic-sounding, yet general literature on the resins that are myrrh and frankincense indicates they are (together) earthy, lemony/citric, anise-like, so not that different to many hops used in modern brewing. Indeed their use in this beer matches well with the standard malt and hops flavours. The beer is a very good golden or (I’d call it) U.K. pale ale style, sort of a charged-up bitter of the type common in England with its bigger brother special or best bitter until the American invasion changed things around a bit. (Yes the older beers are still available, but you have to know what you’re buying and often ask questions or read the website descriptions). In a word, Frank & Sense is in my wheelhouse, and the unusual flavourings in this case don’t detract from what I like or add anything I don’t like. Gold can be consumed with food, it is used sometimes in baking or confectionary, and said to have little or no taste. The beer has a faint metallic aftertaste but whether that is due to the legendary metal I can’t say. Gold flakes also figure in a venerable liqueur from Gdańsk/Danzig, Danziger Goldwasser. Lost Abbey brewing in San Marcos, California had a Christmas beer that used myrrh and frankincense, not gold though I think. That beer was quite a bit stronger than I&G’s, as well. I&G seem to have combined three unusual ingredients in a way not done before, which is cool and of course apt for the season. Myrrh and frankincense are two of the gifts the Magi or wise men famously brought Mary when visiting the new-born Jesus in Bethlehem. To learn about their historic uses, this website article by Cliff Pumphrey offers a crisp, well-informed summary. One other thing: I’m quite pleased to see another beer, albeit limited edition, from I&G that doesn’t use barrel-aging or a wood addition of some kind. That has been their signature, yes, but I think they can enlarge their franchise with beers matured conventionally. Barrel-aged beers inevitably have an oxidized note, plus a coconut/vanillin taste from the American oak generally used. Beer aged over wood staves acquires at a minimum the coconut/vanillin taste – think Chardonnay, or bourbon for that matter. A lot of people like this of course, witness the many Imperial Stouts, seemingly every one you see now, aged in a bourbon barrel, but it goes well beyond Imperial Stout. Many craft beer fans prefer beer without these accents though. Beers such as Frank & Sense, or the very worthy I&G IPA released not long back, respond to that interest. 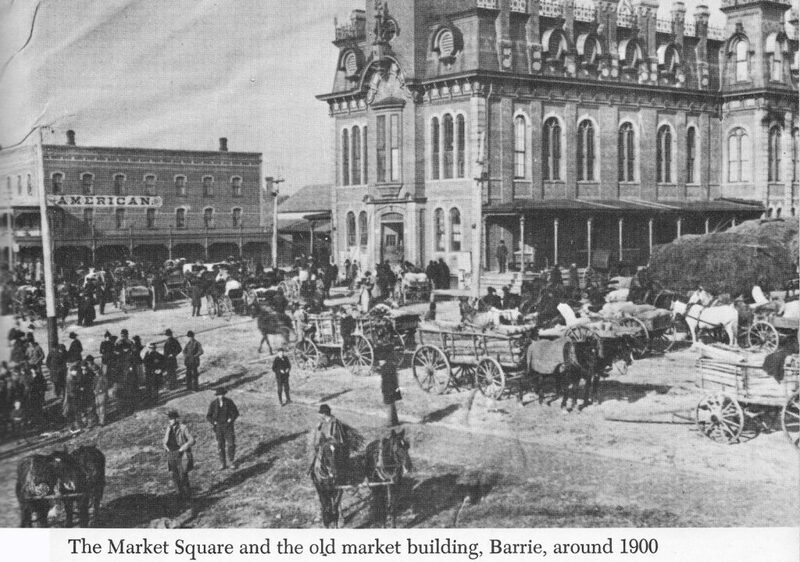 (Pictured is an historical image of Barrie, a town on Lake Simcoe, ON*). A useful website has collected many materials on early Ontario and Canadian history. The main page, located here, is entitled Electric Canadian. It is a good place to chart many references to whisky in pioneer days. They run the gamut, from realistic, non-judgmental observations to more dogmatic – always moralistic – positions. In part, the date of publication seems to make a difference. 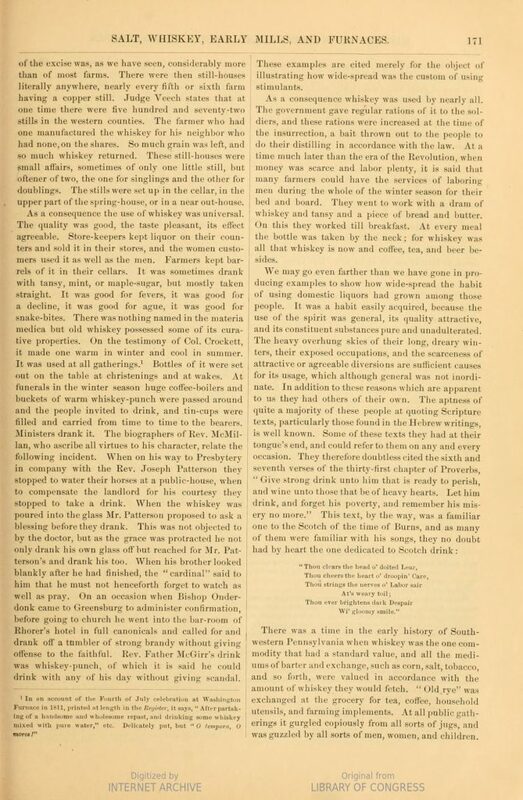 Materials published after about 1860 into the 1930s – when temperance sentiment was cresting – tend to reflect moralism: whiskey was malign, pioneers’ use was well-meant but naive; drunkenness was rife, etc. This is inevitable as the public tone affects how people view things consciously or otherwise. It’s the same thing today of course; try writing a nation’s industrial history without addressing climate change, say. Still, when you put it all together you get a good picture. I’ve referred to some of the sources before, including Susannah Moodie’s interactions with resident “Yankees” and their whiskey ways. Here, I want to focus on three areas: first, use of whiskey with tansy, as I showed yesterday occurred in Pennsylvania (Jack Daniel used it too in Tennessee); second, taste notes comparing frontier whisky to that of c. 1899; third, a vivid description of an early country tavern. Edward M. Morphy (1820-1905) was an Ulster Irish immigrant who came to Canada in 1835 as a jeweller’s apprentice. 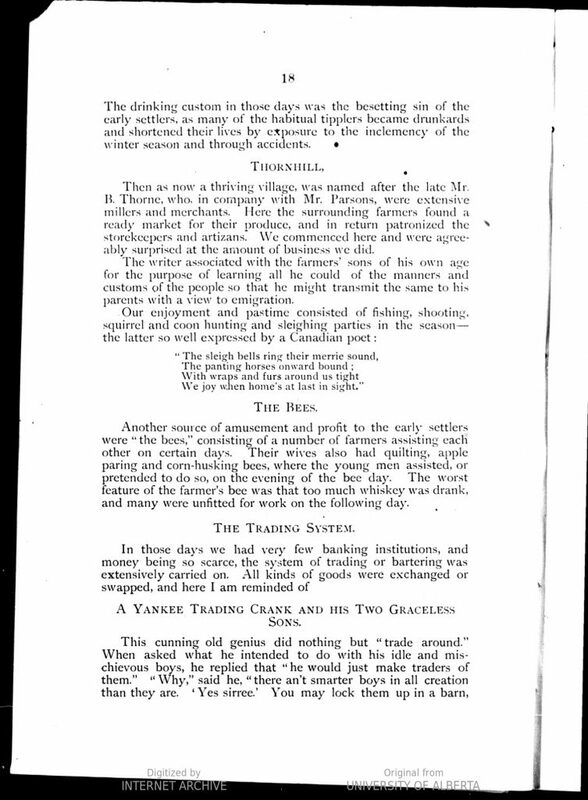 In later years he published a number of works on Canadian and Irish social customs and history, sometimes with a humorous bent (his “bibulous” and “crank” characters illustrate the latter). In 1884 he published a memoir of Toronto, known in earliest days as York, Little York or Muddy York. His pages below (via HathiTrust in this case) illustrate the early use of whiskey here, where the herb tansy was often macerated in it. Tansy in whisky, sometimes with sugar, was a variant of the first American cocktails or bittered slings. Tansy always had vague medicinal associations. Perhaps its use with whiskey was seen to justify more use of alcohol than Hippocrates would have approved. Or maybe people just liked the taste. Tansy has eluded me: I’ve asked for it in small stores and markets from Healdsburg to Halifax and invariably received an uncomprehending look. One day I’ll find it and mix it with Jack Daviels, or Lot 40 Barrel Strength. (Stay tuned, but it may take a while). Other herbs used with whisky included mint, and pennyroyal. Canada has had the cocktail as long as the Americans as initially the same stock of people drank it both sides of the border. I’ve read at least one other account of the barn-raising and similar “bees” which states the men foisted bottles when completing their work but never had an accident; the implication was the practice was on balance beneficial, or at least benign. Perhaps the many critiques of the liquor-fueled bees were informed more by ideology than evidence of great harm. It is hard to know at this distance, really. My sense is Morphy, for his part, was an abstemious man for whom the temperance era proved a boon, something at any rate that must have encouraged his enviably long life for the time. What was the frontier whisky like, often taken “fresh from the still” as we’ve seen before? 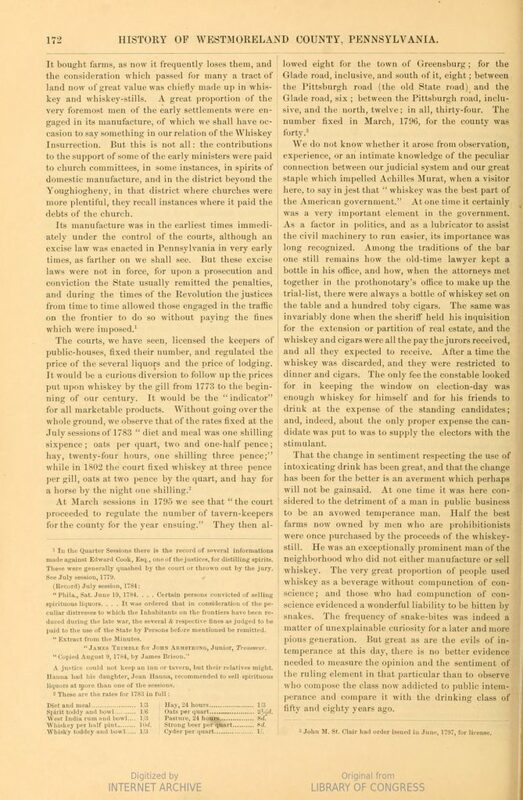 This statement echoes, but with more point and detail, contemporary American statements that the pioneers’ whiskey was superior to the modern form, we saw an instance yesterday from an 1880s history of Westmoreland County, PA.
To suggest that the old stuff was better was partly no doubt meant to excuse a social practice once widely in vogue and now strongly disapproved. And just as today, there was also surely the tendency to eulogize the tastes and products of one’s youth. Nothing is as good as it ever was, right? And yet, I don’t discount such accounts necessarily on this ground. Taste memory can mean something, I know it from my own experience (of course!). How can we parse what the old-timer with the “intimate” knowledge of whisky – an inebriate in other words in Johnston’s estimation – meant? One way to look at it is, he was disenchanted with the Canadian whisky of the 1890s, by then an aged product but largely based on something close to neutral spirit. The oily, congeneric taste of pot still whisky would have been opposite in texture at least. I think the old man was remembering that kind of whisky, whisky perhaps similar to many craft whiskies today. Yet, he said it never made him hungover, while congeneric whisky is known to cause hangovers and clean alcohol, less so. But maybe as a young man the old man had a greater capacity to absorb the punishments of white dog whisky. In sum his comments should not be easily dismissed. Through a long evolution Canadian whisky ended by being a fairly neutral, clean product, deprived as it was of most of its fusel oil (regarded by science then as a rank poison). Maybe he was really saying, I prefer the old oily whisky, distilled at a low proof off the still, to the modern silent spirit blended with a little of the real thing. I reproduce below the vivid account of an English immigrant, Samuel Thompson who stayed overnight in a rude Ontario country tavern. The period is the early 1830s. One may note, first, how Thompson noticed that taverner Root was a Yankee and his manners. Root was almost surely a “late” Loyalist. Thompson with his brothers was travelling to land they had bought north of Lake Simcoe, itself some distance north of Toronto. The way they acquired property was to purchase a “ticket” of a U.E. Loyalist. Loyalists’ entitlements to land could be traded on the market. The visit to the “tavern” is well and drolly described. Note the language of the American and his wife. It is startlingly modern. Until recently it was very common to hear men refer to “the wife” in the U.S. or Canada, and I’m sure many still talk that way, but the usage struck Thompson as bizarre. The way the “Irish” wife spoke amused the visitor. I think it was her “vivacity” that did it, the confident voice (remarked by numerous Britons of their visits to America in the 1800s) but also the language. It is exactly how North Americans speak today except she addressed her husband by his surname. Even “spider” to describe a three-legged iron pan is not strange, I knew what it meant before Thompson explained it. The Colonial era in the northeast U.S. clearly set the tone for many linguistic and other features of North American society for centuries to come. I’ll add too how impressive was the self-reliance and, as the writer put it again, “vivacity” of the people under observation. Living in the rudest conditions they carved out a life for themselves that must have struck the visitor, counter-intuitively, as enviable in its way. This is the meaning I think of his statement that he slept soundly despite the unpropitious circumstances. We had walked a distance of eight miles, and it was quite dark, when we came within sight of the clearing where we were advised to stop for the night. Completely blockading the road, and full in our way, was a confused mass of felled timber, which we were afterwards told was a wind-row or brush-fence. It consisted of an irregular heap of prostrate trees, branches and all, thrown together in line, to serve as a fence against stray cattle. After several fruitless attempts to effect an entrance, there was nothing for it but to shout at the top of our voices for assistance. Presently we heard a shrill cry, rather like the call of some strange bird than a human voice; immediately afterwards, the reflection of a strong light became visible, and a man emerged from the brush-wood, bearing a large blazing fragment of resinous wood, which lighted up every object around in a picturesque and singular manner. High over head, eighty feet at least, was a vivid green canopy of leaves, extending on all sides as far as the eye could penetrate, varied here and there by the twinkling of some lustrous star that peeped through from the dark sky without, and supported by the straight trunks and arching branches of innumerable trees–the rustic pillars of this superb natural temple. The effect was strikingly beautiful and surprising. Nor was the figure of our guide less strange. 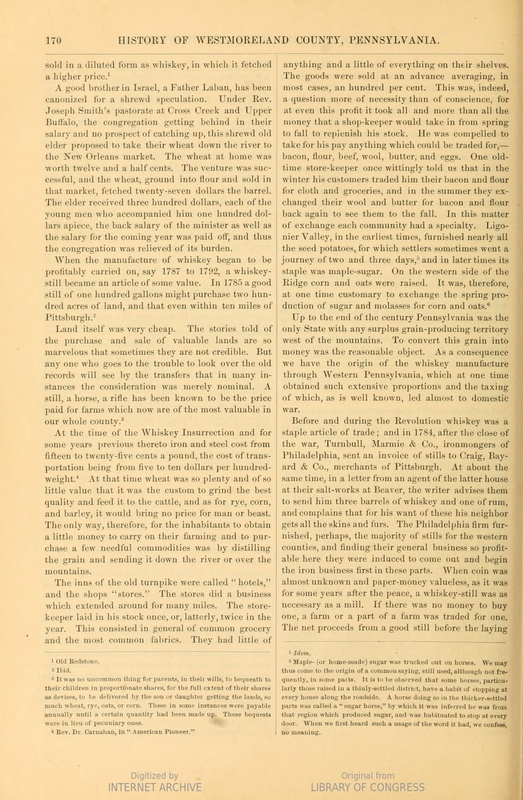 He was the first genuine specimen of a Yankee we had encountered–a Vermonter–tall, bony and awkward, but with a good-natured simplicity in his shrewd features; he wore uncouth leather leggings, tied with deer sinews–loose mocassins, a Guernsey shirt, a scarlet sash confining his patched trowsers at the waist, and a palmetto hat, dragged out of all describable shape, the colour of each article so obscured by stains and rough usage, as to be matter rather of conjecture than certainty. He proved to be our landlord for the night, David Root by name. The floor was of loose split logs, hewn into some approach to evenness with an adze; the walls of logs entire, filled in the interstices with chips of pine, which, however, did not prevent an occasional glimpse of the objects visible outside, and had the advantage, moreover, of rendering a window unnecessary; the hearth was the bare soil, the ceiling slabs of pine wood, the chimney a square hole in the roof; the fire literally an entire tree, branches and all, cut into four-feet lengths, and heaped up to the height of as many feet. It was a chill evening, and the dancing flames were inspiriting, as they threw a cheerful radiance all around, and revealed to our curious eyes extraordinary pieces of furniture–a log bedstead in the darkest corner, a pair of snow-shoes, sundry spiral augers and rough tools, a bundle of dried deer-sinews, together with some articles of feminine gear, a small red framed looking-glass, a clumsy comb suspended from a nail by a string, and other similar treasures. Inquiring with alarm what was the matter, we learned that the cast-iron pan on three feet, which she used for her cookery, was called a “spider,” and that its fracture had occasioned the exclamation. The injured spider performed “its spiriting gently” notwithstanding, and, sooth to say, all parties did full justice to its savoury contents. Bed-time drew near. A heap of odd-looking rugs and clean blankets was laid for our accommodation and pronounced to be ready. But how to get into it? We had heard of some rather primitive practices among the steerage passengers on board ship, it is true, but had not accustomed ourselves to “uncase” before company, and hesitated to lie down in our clothes. After waiting some little time in blank dismay, Mr. Root kindly set us an example by quietly slipping out of his nether integuments and turning into bed. There was no help for it; by one means or other we contrived to sneak under the blankets; and, after hanging up a large coloured quilt between our lair and the couch occupied by her now snoring spouse, the good wife also disappeared. In spite of the novelty of the situation, and some occasional disturbance from gusts of wind stealing through the “chinks,” and fanning into brightness the dying embers on the hearth, we slept deliciously and awoke refreshed. A tavern here means foremost a place of shelter and for food. No alcohol was available, clearly, so it is not mentioned. Elsewhere in the book Thompson does mention whisky though. See in this full text p. 83 where he reports, with his own concurrence, the “supreme contempt” of neighboring Irishmen and Highlanders for the weakness of Canadian whisky. I think this resulted from two causes: some of it probably was one run from the still, coming off at 20% abv if that. Second, a lot of whiskey sold at retail then was diluted with water – which makes sense for people taking bottles to building sites and into harvest fields. Some people are never satisfied eh? Still, even swigging 20% booze on a worksite isn’t namby-pamby is it. We may not always have offered impeccable British proof (57.1% abv) at retail. But we knew how to take a drink, then. *Note re image: the image of Barrie from 1900 was sourced from this historical website with the excellent name “Progress is Fine but it’s Gone on for too Long”. All intellectual property in or to image belongs solely to the lawful owner, as applicable. Image used for educational and historical purposes. All feedback welcomed. Good article by Canadian beer writer Jordan St. John at St. John’s Wort, on how a wider, more interesting choice of British beers would be salutary at LCBO. (The subtext here is beers with a traditional U.K. palate, not versions of North American styles. It’s not that the latter aren’t worthwhile to have, but given we make that here, the ‘British shelf’ should reflect the traditional taste). I’d think today given the strength of brewing in Britain there are numerous brewers making characterful examples of traditional styles: bitter/pale ale/IPA, mild ale, strong ale, porter. But in the past I should say there was a divide in quality between canned/bottled and cask-conditioned in the pub. Most British canned and bottled beer, with few exceptions, did not approach the cask version in flavour and quality. Canned/bottled seemed by contrast anodyne, like the keg ales introduced in the 60s and 70s to replace cask beer. Why was this? At least three reasons: the canned/bottled brews were usually pasteurized, the cask not; the cask beers were often dry-hopped; and the cask was not filtered after racking, the residual yeast deepened the palate. They were really a kind of lager IMO, a darkened sweetened form, intended to be drunk as cool as possible and to refresh. To be sure there were exceptions, Courage Imperial Russian Stout of course, Traquair Ale in Scotland (not the herb-flavoured one, the regular one), later Le Coq Extra Double Stout from Harvey in Sussex, maybe a beer or two from Adnam’s. Timothy Taylor’s bottled beers were always a cut above too, I should add. But these were usually not easy to find and not the kind of staple the cask beers were, for the dedicated beerperson, I mean. The action was at the pub, in cask ale that is – a model quite different to how craft beer developed in North America where a fresh can or bottle usually is as good as the draft. I’d think though with the growth of the smaller breweries especially in the last 20 years you can find now a larger range of bottled and canned beers that feature the British palate at its best. 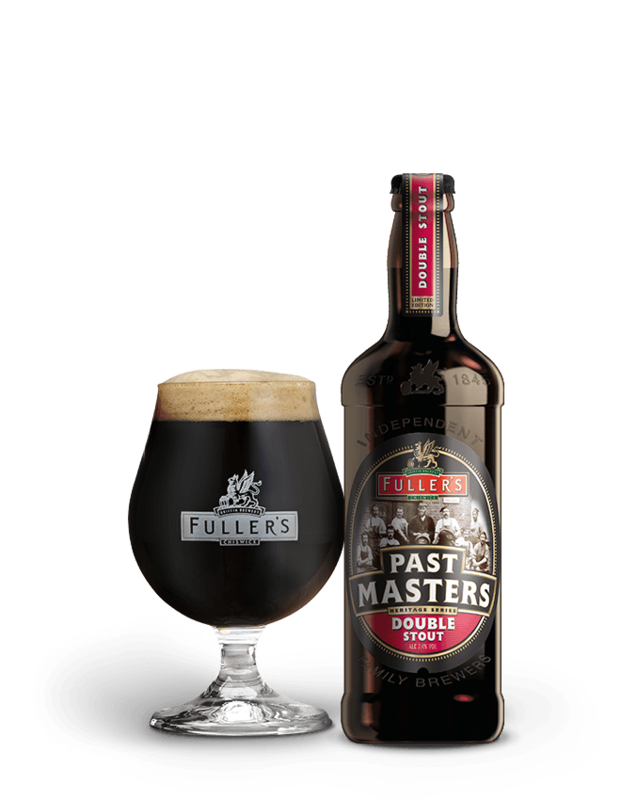 I recall the double stout from Fuller shown, a historical recreation, that was outstanding. See more information here. We need to see that beer here. So I agree LCBO should look for better traditional-tasting U.K. beer. And why not have a British beer festival in Toronto? With domestic contenders allowed too. It’s full of British malt, dark fruit esters, lovely floral English hop – 100% Albionic and really good, it shows why British beer was considered an aristocrat of the genre for centuries. Signature has been available for some time now but it is at a pitch of quality. I don’t recall it tasting like this before and the label states British-style, which I think is new too. If anyone in Ontario wants to know the true English draught beer taste, you have it right there – a bit more carbonated but you can decrease that in the pour, or use a swizzle stick. 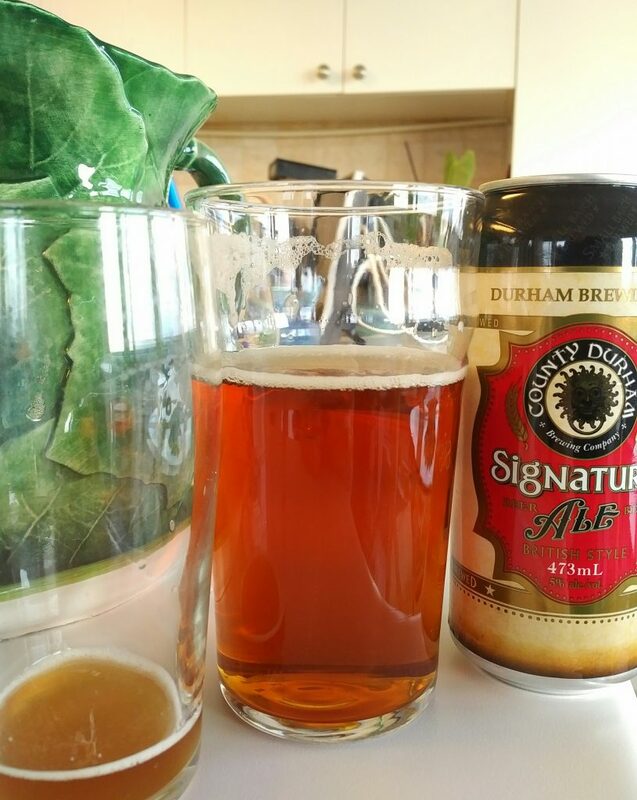 I’m hoping LCBO will expand its U.K. range to include the topmost in quality, meanwhile I’m stocking up on Durham Signature. *But do not drink it cold, only lightly cool or even “shelf”: otherwise you will lose much of its value. Also, the cans I saw were expiry April 30, 2018, probably issued a month or two ago not more. This post is the third part of a discussion inaugurated by Part I and Part II. Tanya MacKinnon’s important study of the historical geography of Ontario distilling between 1850 and 1900 contains some interesting charts at pp. 85-86, of which a small extract is shown here. In 1857, Durham County, location of Port Hope, produced 92,025 gallons of whisky. This was output of three distilleries (per 1851 census). York-Peel Centre, which took in Gooderham & Worts, produced in 1857 about 450,000 gallons, presumedly mostly or all the output of G & H.
Compared as well to Waterloo County where Hespeler, later Seagram, and other distilleries operated, Durham was behind by about half. However, if you add Northumberland County’s 81,047 gallons, produced mostly in Cobourg which is a just a few miles from Port Hope, the combined production was 173,000 gallons per year. Durham and Northumberland were close enough in geography and interests then to warrant being one political unit, the United County of Durham and Northumberland, albeit the chart above showed the units separately. Port Hope had 4,100 people in 1861 and Toronto, 45,000. 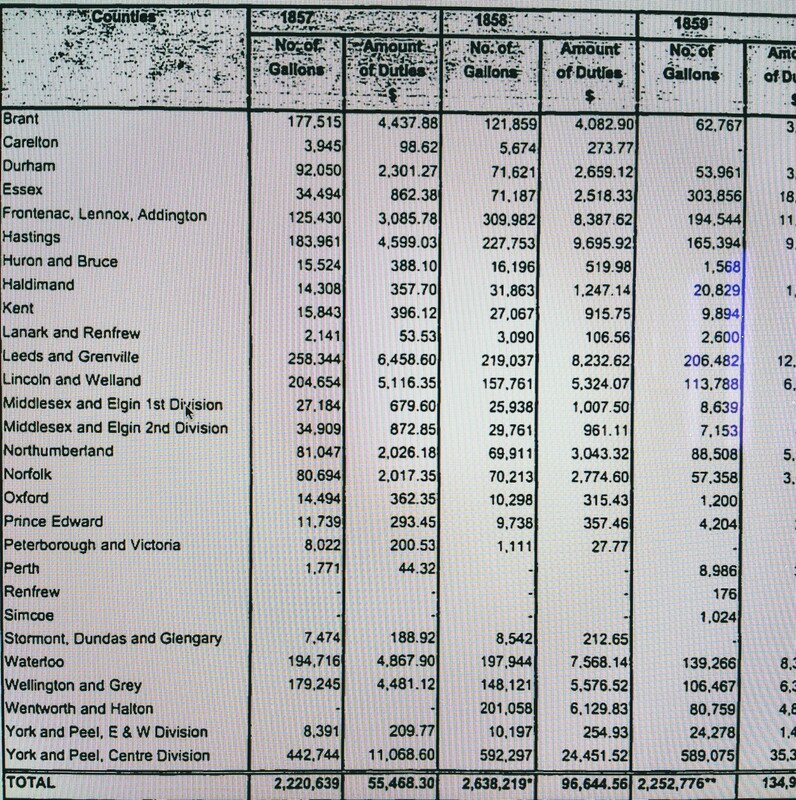 In 1857 even Durham alone produced per capita double the whisky Toronto did. Of course as the chart extract shows, Durham and Northumberland declined after whereas Essex County, containing newly-established Hiram Walker in Windsor, enjoyed rapid growth. Toronto, primarily Gooderham & Worts again, grew or held its own. What this shows is that little Port Hope and the ditto Cobourg were producing considerable amounts of whisky and contributing pro rata to the provincial treasury, as late as 1857. They weren’t fringe/artisan producers albeit none of their plants entered the top 10 of production by distiller. Had, say, the distillers of Cobourg and Port Hope merged, perhaps with those in Peterborough, and/or adopted a different business plan, they might well have challenged what became the Big 5 and their hegemony. Of course, who knew in 1861 what would happen to the new Hiram Walker and Hespeler/Seagram in Waterloo, or how Wiser and Corby would grow in influence despite their regional bases of Prescott and Belleville, relatively small localities then and now? There were still 73 distilleries in Ontario in 1861. Even later in the century the new Royal Distillery in Hamilton, as I’ve discussed earlier, grew to challenge the Big 5, only to fade away with the onset of WW I. The pre-Big 5 distilling heritage of Ontario is a vital part of Canadian distilling history, not least in terms of the type of whisky made. There is no evidence the Big 5 made different or better whisky than all the other distilleries in 1861 especially Port Hope’s which had won high plaudits for quality. By dint of good business skills and fortune the Big 5 took the palm, and set the stage for the Canadian whisky industry of the 20th and 21st centuries. But they didn’t create Canadian whisky. *These important early settlers in Canada are known, in historiography generally, as United Empire Loyalists, often abbreviated to U.E. Loyalists. This post is the second part of the Port Hope whisky posts inaugurated by Part I, here. There is another subject we would fain forebear mentioning but deem it would be more reprehensible by maintaining a reticence than by giving it publicity, for it formed so strong a feature in the state of society that sociability seemed incomplete without it. We will, however, whisper it to the private ear of the reader. We have reference to the general use of whisky as a token of friendship. To make a visit to a friend’s residence, the whisky bottle, like the friendly pipe of the Indian, was invariably handed round; to refuse partaking of its contents would be considered an act of unfriendliness. Our first settlers must have bequeathed this custom to their posterity as they seemed to be imbued with the impression that distilleries were necessary companions to the saw and grist mill, as their erection invariably followed in rapid succession; and the emigrants who succeeded those well-meaning pioneers followed their plan with extending views; for there were no less, at this period of the existence of our little town, than 8 distilleries and Port Hope was celebrated for producing the best whisky in the Province. The traveller’s attention would be arrested by placards with ‘Port Hope Whiskies for sale here’ printed in a large type and posted in the windows of wholesale grocery and liquour stores and on the walls in the barrooms of hotels and saloons in all the principal towns of the Province. A highly rectified article was manufactured by special order and sent to Montreal, thence to be transformed into brandy, rum and gin, and, thus metamorphosed, was sent back here and to other parts of the Upper Province, to be sold by our merchants as the prime foreign article. The unenviable celebrity Port Hope had attained from the quality of its whisky was not limited to Canada. How far it had travelled, it is impossible to say, but the following incident shows it had reached England. A lady resident of this town, when in London, visited the Tower and when attaching to her name the place of residence in the registry book kept for that purpose, in the presence of the guide, an old soldier who had been stationed in Canada, he exclaimed – “Port Hope! I know that place, I have drunk its famous whisky.” He was very attentive in giving her information. There is, however, a pleasing change in this town now with regard to these institutions that presented so prominent a feature; they are superseded by eight churches which present a very great contrast. This change, no doubt, has been brought about by that imperceptible agent, moral suasion, this accomplishing that which legislative coercion would have been incapable of performing. It is a pity we cannot present the pleasing feature of the demolition of the whisky traffic of the present day. There were formerly five or six large distilleries in operation here and the whiskey of Port Hope had a high reputation from one end of the country to the other. Ever since these statements books, articles, and websites dealing with 1800s Port Hope history mention its famous whisky. Yet even in 1850 there was published acknowledgement of the fame and economic importance of whisky to Port Hope. Three years earlier, a similar observation is recorded in the Western Literary Messenger calling Port Hope’s whiskey Canada’s Glenlivet. This book by Mark Staniforth mentions whisky types sold in Lower Canada in the 1840s and includes “Port Hope whisky”. Also mentioned is (James) Morton’s whisky, of Kingston, ON, of whose own reputation we have written earlier. Port Hope was one of many Ontario localities, but its whisky had cachet and was regularly exported to near and more distant markets – including Kingston. The reference in the 1877 letter to a rectified “article” refers to a high-proof distillate of neutral character made to blend with brandy, rum or gin, perhaps with flavourings, to produce a blended version of these spirits. This was a typical 19th century technique and indeed still applies for the bulk of Canadian whisky made today. 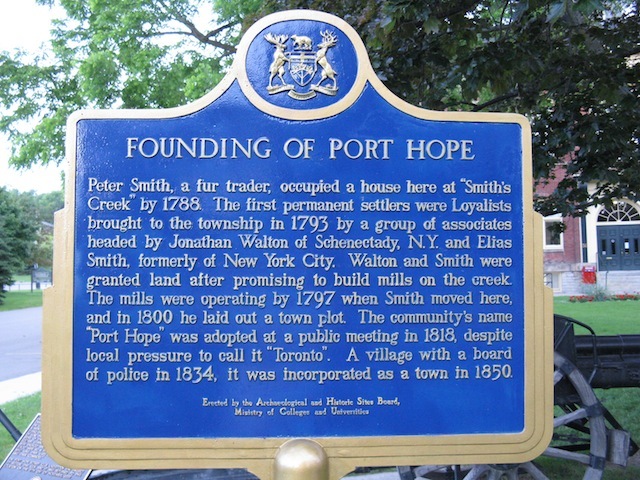 The first settlers in Port Hope were mostly “late” American Loyalists, brought by Elias Smith, also of American origin who came with two partners from Montreal to assign lands surveyed by the Crown. Some settlers were English or other British and as the century progressed more and more came from Britain, but the town was founded largely by American families decamping some years after the initial Loyalist influx to Canada, a pattern familiar in other parts of Ontario. Viewed from the industrial standpoint Port Hope’s life divides itself into three periods; the first when the Town was rendered famous by the output of its numerous distilleries; the second when it became equally important as a railway terminus and port and the third and present period when it is striving to maintain itself at its former level, though suffering from severe losses over which it has had no control. It was in 1802 that Elias Smith built the first distillery near the site of the skating rink and began the manufacture of the famous Port Hope brand of whiskey. Within a few years other distilleries started operations and by 1826 no fewer than eight were in existence in the Town, while during the thirties even a larger number were kept busy supplying the world with its favourite beverage. A large proportion of this production was shipped to Montreal, where it was transformed into brandy, rum and gin and returned to its native town under the guise of a genuine foreign article. In a communication kindly sent to us by Rachel Arnaud, Archivist, Port Hope Archives in Port Hope she provided a 1973 newspaper article listing various owners or occupiers of distilleries in Port Hope between 1802 and the mid-1850s. These included Elias Smith, Thomas Molson, Edward Dodd, John David Smith, David Smart, Erasmus Fowkes, W. Benson, Lynn & White, E. Clarke, and W. Waller. The article states Elias Smith’s distillery was located at what is now Queen and Roberston Streets in Port Hope. Numerous of the distilleries were on Cavan Street. Molson’s distillery in 1857-1858 was mashing 30 bushels a day, according to an ad Ms. Arnaud also sent. As mentioned, some of the whisky was sold in Kingston to the east along the lake. 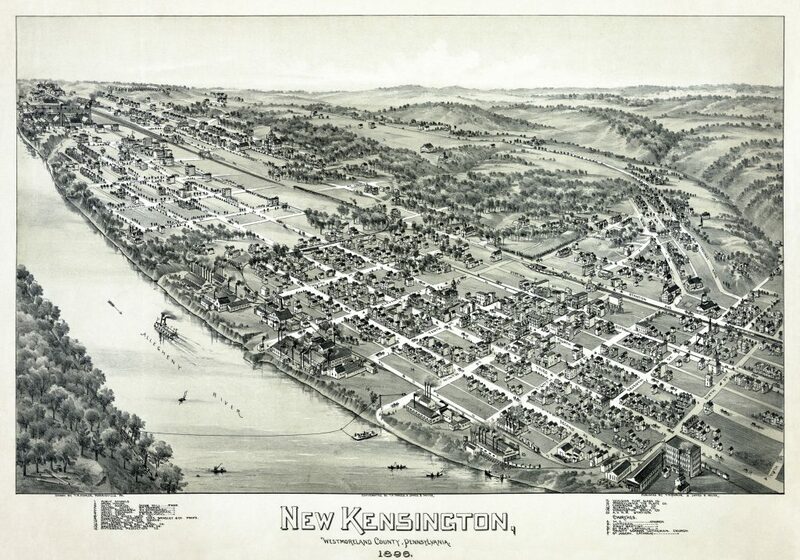 One may recall Kingston in the first half of the 1800s was a significant governmental, military and commercial city. Joseph Hall in Kingston in 1842 advertised in the Chronicle and Gazette being in receipt of a stock of 250 barrels of Port Hope whisky for sale. At a conservative estimate of 30 gallons per barrel that is 7,500 gallons of whisky, not a small amount for the period – even in 1861, 19 years later, Kingston had a population of 14,000. In 1842 Port Hope was tiny, around 1,200 but as for some industries in small places exports motored part of the economy. In his advertisement he called Port Hope whisky a “well-known article”. Other ads in the same period in Kingston regularly advertised Port Hope whisky even though Kingston produced considerable whisky of its own, notably by Morton but there were numerous other distilleries. For example, William Garratt regularly advertised in the 1820s for “rye and Indian corn” for his distillery, see my earlier discussion here. It is thus evident that the Port Hope stills supplied more than a local market and had a special reputation including in an important centre at the time, Kingston. After 1850, in tune with the general pattern in Ontario, drinking was progressively viewed in a different light. The abstinence movement gained ground and the number of distilleries fell, with the “Big 5” finally dominating the industry by 1900: Seagram (Waterloo), Hiram Walker (Windsor), Gooderham & Worts (Toronto), Corby (Corbyville/Belleville), Wiser (Prescott). Despite this a number of other distilleries continued in operation including in Perth and Hamilton, some of which we discussed earlier. But they were outliers in what had become a new era. In a word, Port Hope’s whisky industry disappeared by the 1870s. Why is this, apart the growing temperance movement? It wasn’t due to the quality of the product, I suggest given the special reputation it had when, say, Gooderham & Worts was just finding its feet in distilling in Toronto and Hiram Walker was years away from starting his operation. The Loyalist founders of Port Hope, indeed the Americans who formed the great majority of Ontario’s first European settlers, bequeathed the taste for grain whisky as I’ve showed earlier and the extract above states clearly. The taste came long before Hiram Walker or the other Big 5 made Canadian whisky. Port Hope’s distillers made an especially favoured version, and I doubt that any of the Big 5 ever made better than the crème of Port Hope. The reason Port Hope’s whisky faded, in our view, was Port Hope faded. After the Grand Trunk railway connected Port Hope to Toronto, water commerce declined, until then Port Hope’s special advantage. The advent of different forms of power for industry – notably steam and then electricity – made water-power less important. The mills of the Ganarska river basin of which distilling was initially a by-product closed or were concentrated in Toronto as for so many similar towns in Ontario. See this illuminating discussion on these points by Port Hope historian Ian Montagnes. There are also the imponderables of personalities and business: the Big 5 may simply have emerged – or it was an additional factor – due to the special skills of their founders, men like Joseph Seagram and Hiram Walker, not because their product was better or so different from that of distilleries which never benefitted from similar management ability. Can one say that Jack McAuliffe’s landmark Albion Ale (1977) was radically different from the Sierra Nevada Pale Ale (1981) that became the standard-bearer of American craft brewing? No, it’s just that for a variety of reasons, McAuliffe didn’t make it and Ken Grossman did. In regard to grain bill for Port Hope distilling: my reading of early Port Hope and Ontario history suggests that a broad range of crops was raised in Hope Township: barley, wheat, rye, oats, corn, buckwheat, peas. I have not as yet been able to determine the mashes used for Port Hope whisky. I believe typically a mash of barley malt, rye, and corn or oats was used, similar to how whisky was made in the U.S. northeast and numerous parts of the north shore of Lake Ontario (see my earlier posts for many details, especially here). I would think in regard to quality that Port Hope whisky had a cleaner taste than the usual whisky of commerce. The reference to rectified whisky being sent to Montreal for blending, a pattern that also existed in early 1800s American distilling (see Samuel M’Harry’s Practical Distiller), may provide a clue here. Stills were increasingly in use from the early 1800s to produce a more refined spirit, as shown e.g., here in 1835 where Hunt & Morton in Kingston advertised using, uniquely in the province, a “patent copper rectifying still”. The ad suggested that from whiskey to “alcohol” different proofs could be supplied on short notice. This still may have been an early Coffey still, patented 1831, or another of the many patent stills developed during the 19th century that improved the quality of a basic two-pot still highwines. The term “patent” suggests the still was more than a double or even treble pot still, in other words. As well, each producer had his way to rectify the product, to reduce the oily, congeneric taste of new whisky. He might double distill it or perhaps triple distill it, as the Irish did and still do for their single pot still whisky. He might use a particular method of charcoal or other filtration, as existed as well at Gooderham & Worts and Hiram Walker before they adopted steam distillation technology. The 1835 ad of Hunt & Morton also requested supply of hardwood charcoal, suggesting that some of their spirit was filtered in a charcoal tub similar to what Jack Daniel’s still does today. And liquor was often blended, once again. Perhaps Port Hope whisky was an early blended Canadian whisky, a mix of highly refined whisky with heavy pot still or similar (low distillation proof) whisky. What distinguished the whisky of Port Hope was probably some factor of rectification, perhaps even a flavouring of some kind. We continue our investigations, see Part III. Note re image: The image above was sourced here, from the invaluable Ontario Historical Plaques site, a website of Alan L. Brown that chronicles in image Ontario’s historical plaques. Copyright in the image belongs we believe to Mr. Wayne Adam and is used here for educational and historical purposes only. All feedback welcomed. *For what it’s worth in 1851 William H. Smith, in his historical study of Canada West, albeit speaking generally referred to “rye” as the grain from which whisky was made. We would deduce from this and other evidence to date that Cavan Street whisky also employed rye as its base. See his comment here.